This belt badge clip was specifically designed for a badge to sit completely recessed. Your badge will be protected and it will not "pop out" like older styles. Double layered leather and heavy duty holster stitching will ensure years of service. 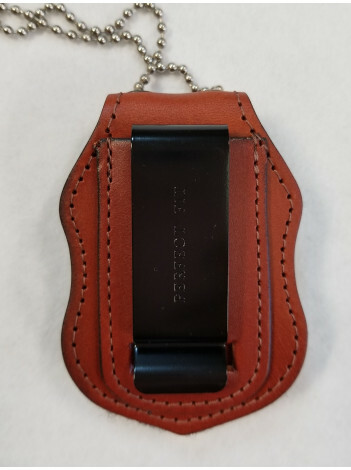 All belt badge holders come with a metal clip on the back and a chain so that it can be worn on the belt or around the neck. 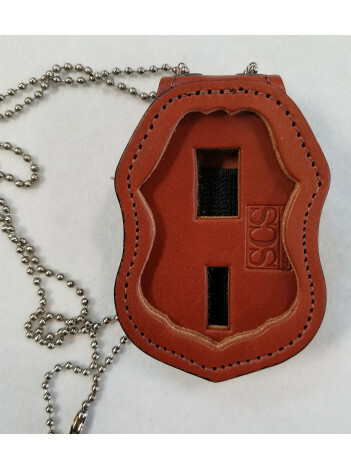 Attaching the badge is made simple with a hook fastener closure which also doubles as storage for the neck chain when not in use.